Jack’s has replacement commercial Kees pulleys. When you need a Heavy Duty Cast Iron Pulley or Variable Speed Pulley for your commercial Kees equipment, Jack’s is the place to get it! 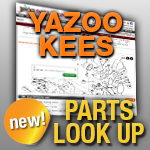 We have the parts you need to help you get your Kees lawn mower repairs under way.